Sony Xperia L now available through online retailer Snapdeal for Rs. 18,990. It is a mid range smartphone from Sony. The Xperia L come with 4.3 inch TFT capacitive multi-touch touchscreen with 480 x 854 pixel screen resolution. Dimension of Xperia L is 128.7 x 65 x 9.7 mm and 137 gm weight. Sony Xperia L loaded with Andriod 4.1 (Jelly Bean) OS and it powered by a 1.0 GHz MSM8230 Qualcomm processor with 1 GB of RAM and Adreno 305 GPU. It features easy multi tasking and super graphics quality. Dual cameras available for capturing needs and making video calls. 8 Megapixel Exmor RS autofocus rear facing camera with LED flash and VGA front facing camera. 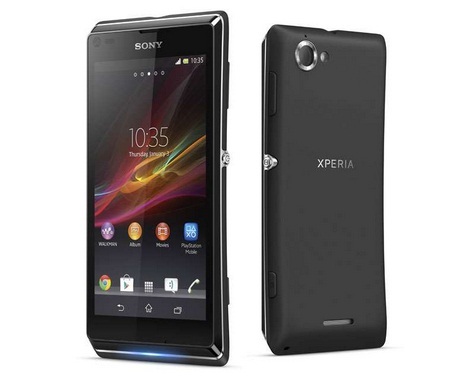 Xperia L built in with 8 GB of internal storage space and external memory support up to 32 GB via MicroSD card slot. FM radio, Audio player, Video player, and 3.5 mm Audio Jack enabled. Xperia L features internet access via GPRS, 3G, Wi-Fi, and EDGE. Other connectivity options are Bluetooth, USB, GPS, and 3.5 mm Audio Jack. Xperia L has a 1750 mAh Li-Ion battery, that provide up to 498 hrs stand by time and 9 hrs talk time.